Invisalign® is becoming an increasingly popular choice for patients today. The Invisalign® approach to straightening teeth utilizes a custom-made series of clear aligners created just for you. The aligner trays are made of smooth, comfortable and virtually invisible plastic that you wear over your teeth. It is also easy to insert, and simple to remove. Because you can remove Invisalign® aligners, you can enjoy all your favorite foods and beverages without worrying about getting food stuck in the wires and brackets of traditional braces. 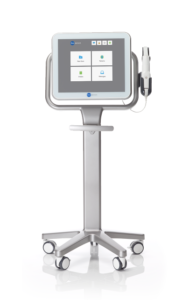 At James River Dentistry, Invisalign® treatment is even easier and more proficient with the use of our latest iTero Digital Impression Scanner. This state-of-the-art technology allows our well-trained technicians to take accurate 3-D digital images of your mouth. By utilizing this digital scanning system, we eliminate the need for impressions and expedite the process of starting your Invisalign® treatment. Thinking about your child and whether orthodontic treatment might be needed at some point? Find the answers to your questions in the Parent’s Guide to Orthodontics.